Opt for wide walkways – We recommend that paths throughout a kitchen be at least 36 inches wide. Ideally, walkways within the cooking zone should be about 42 inches wide for a one-cook kitchen and 48 inches for a two-cook setup. Be sure to adjust any kitchen islands and peninsulas accordingly. Direct traffic – This is a big one for parents with young children. The last thing you want is to give your son or daughter the opportunity to catch handles and cause spills when running through the kitchen. Make it a point to keep the cooktop out of high-traffic areas. It’s also a good idea to make the fridge accessible to those passing by and people working in cooking/cleanup areas. Avoid corners – Don’t forget to plan space for cabinet and appliance doors. In this regard, stay away from corners as much as possible. Of course, watch so that no doors will bang into each other if open at the same time. Figure out what the island will be used for – Form follows function here. Do you plan on cooking and eating on your kitchen island? Then plan enough space so the cooktop is safely separated from the dining area. 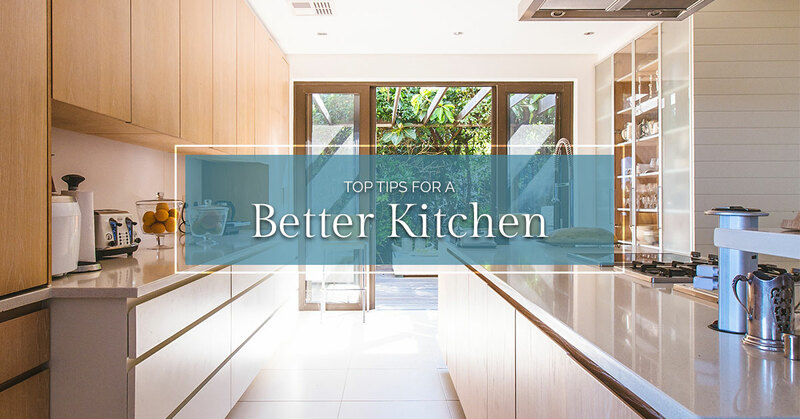 Pay attention to the countertops – Would you consider yourself a master chef? If that’s the case, then consider more counter space. On the other hand, if you rarely cook or just stick to simple meals, minimal counter space makes the most sense. Store knives smartly – Try hanging your knives on a magnetic strip tacked to the backsplash. This makes it easy to spot the one you need and keeps your child away from dangerous items. Install multiple outlets – With as many appliances as you have, one outlet doesn’t make a whole lot of sense. So install several ones along the backsplash and on the island for extra convenience. Make cleaning easier – There are certain design choices that make cleaning time easier. For example, under-mount sinks don’t have a crumb-catching rim to worry about. Use light colors in a small kitchen – Keep in mind that soft shades and natural lighting helps visually expand a small space. In contrast, dark color schemes make an already small space less inviting. Find a focal point – This is true for master bedroom ideas, living room design ideas, etc. Though you want to make a splash with interior design, the kitchen isn’t the best area for splashy tile, fancy floors, and bright cabinets. Pick one focal point and use other small details to complement the space. At Soleil By Design, we’re all about enhancing homes and enriching lives. You can feel comfortable knowing that our kitchen designer never uses a “one-size-fits-all” approach. From bedroom design and bathroom design to kitchen design and whole house design, we provide beautiful, professional, and custom results. Our award-winning interior design firm focuses on what you want and nothing else. Soleil By Design helps you make your dream a reality within your budget. Call our Seattle interior designer and get started revamping your kitchen.